Hisashi Iwakuma…he and his wife, Madoka, have the three kids, daughter Uta, son Towa and daughter Rima…attended Horikoshi High School…played in 2004 Athens Olympics and 2009 World Baseball Classic…originally selected by Osaka Kintetsu in fifth round of the 1999 NPB amateur draft…nicknamed "Kuma," which is Japanese for "Bear." Was 0-2 with a 4.35 ERA (15 ER, 31.0 IP) with 16 strikeouts in 6 starts with Seattle… underwent arthroscopic right shoulder debridement surgery on September 27…surgery was performed by Dr. Keith Meister in Dallas, Texas…on 10-day DL May 10 (retro to May 7) with inflammation in right shoulder before being transferred to 60-day DL on July 24… sent on rehab assignment on June 14 and made two starts with High-A Modesto, going 0-1 with a 6.00 ERA (4 ER, 6.0 IP) before recall (but not activation) from rehab on June 22. The Totals - Was 16-12 with a 4.12 ERA (91 ER, 199.0 IP) with 147 strikeouts and 46 walks in 33 starts...Team Leader - Led the Mariners in wins (16), starts (33), innings (199.0) and strikeouts (147)... Leaderboard - Among American League leaders, ranked T6th in wins (16), T4th in starts (33), 11th in innings (199.0 IP)... Just Win - Earned a career high 16 wins (previous: 15, 2014)…became the 7th Mariners pitcher to record at least 2 seasons with 15 or more wins, joining Jamie Moyer (4x), Freddy Garcia (3x), Felix Hernandez (3x), Randy Johnson (3x), Marc Langston (3x) and Aaron Sele (2x)... Eating Innings - Tossed 199.0 innings, the 2nd-most in his MLB career (219.2 IP in 2013)... Honors - Named Mariners Pitcher of the Year by the Seattle chapter of BBWAA…the 2nd such honor in his career (also: 2013)...Quite the Finish - Was 15-8 with a 4.03 ERA (67 ER, 149.2 IP) with 109 strikeouts in his final 25 starts of the season... Winner - His 15 wins from May 20 through the end of the season were T4th-most in MLB, trailing Cleveland's Corey Kluber (16), Boston's Rick Porcello (16) and Washington's Max Scherzer (16) and tied with Toronto's J.A. Happ and Chicago-NL's Jon Lester... Japanese Leaderboard - Recorded a career-high 16 wins, T2nd-most in a single season by a Japanese-born pitcher, trailing only 18 wins by Daisuke Matsuzaka-BOS in 2008… joins Yu Darvish-TEX (16 in 2012), Hiroki Kuroda-NYY (16 in 2012) and Hideo Nomo-LAD (16 in 1996, 2002 & 2003) as the only Japanese-born pitchers to record 16 wins in a season...Streaker - Posted a 5-game winning streak, June 28-July 23...marked the second time in his career that he has won five straight starts (also: Aug. 8-Sept 5, 2014)…won a career best 7 straight starts Aug. 16, 2013-May 20, 2014... Rotation Rock - Was the only member of the Mariners Opening Day rotation to make every scheduled start...Eight was Great - Won 8 straight home starts, May 25-Aug.8…went 8-0 with 2.62 ERA (16 ER, 55.0 IP) in those 8 starts...only 2 Mariners pitchers (4x) have won more than 8 straight home starts (R. Johnson, 16 & 11; J. Moyer, 10, 2x)...Paul Abbott also won 8 straight... Cloud Nine - Won 9 games in the first half, a career-high for wins before the All-Star Break (8 in 2013 & 2014)...He's Got Backup - Had a 5.43 run support average, 10th-highest in the American League (120 runs in 199.0 innings). Went 15-9, 3.52ERA (70 ER, 179.0 IP) with 154strikeouts in 28 starts (17 quality starts)... Recorded single-season career-high in wins with15, going 15-9 in 28 starts... Ranked 4th in the AL witha 1.050 WHIP, fourth-best in clubhistory (holds 2nd-best mark with 1.006 in 2013)... Walked only 21 batters in 28 starts…ranked second in MLB with 1.06 BB/9.0IP (P. Hughes, MIN - 0.69) and 3rd with 7.33 strikeout-to-walk ratio…recorded 14 starts without issuing a walk, 2nd-best in MLB (Hughes - 19)... Went 8-6 with a 3.02 ERA (34 ER, 101.1 IP) in 15 starts at Safeco Field…owns a career 2.82 ERA in 49 G/42 GS at Safeco Field... Career-high 8.2 innings July 12 vs. Oakland…held the A's scoreless until a 2-out, 2-run home run by Brandon Moss in the top of the ninth... Recorded pair of 10-plus strikeout games, July 7 vs. Minnesota (10) and Aug. 19 at Philadelphia (11)…has 4 career 10+ strikeout games... Allowed 70 runs, all earned, in 28 starts; 2nd-most runs allowed in a seasonin club history without allowing an UER (Pineiro, 118 in 2005)... Recorded season-high 20.0 consecutive scoreless innings July 1-12…three separate scoreless streaks of at least 20.0 innings in his MLB career: July1-12, 2014 (20.0 IP), Sept. 13, 2013-May 3, 2014 (25.0 IP) and May 26-June 10, 2013(23.2 IP)…became the ﬁrst pitcher since Joe Nathan in 2004-05 to have three 20.0+scoreless innings streaks over a two-season span (ﬁrst in Mariners history),and the ﬁrst starter since Dwight Goodenin 1984-85 (4 steaks of 20.0+ scorelessinnings)... Did not allow a stolen base during the season, with attempted basestealers going 0-for-8... Became the fifth Japanese-born pitcher with 15 wins in a season: Hideo Nomo (3x), Daisuke Matsuzaka (2x), Yu Darvish, Hiroki Kuroda... Set a clubrecord for consecutive scoreless inningsat 27.0, ending after 2.0 innings in hisseason debut May 3 at Houston… streakdated back to Aug. 21, 2013...previousrecord was 25.0 innings, shared by Brian Holman (6/27-7/19/84) and Randy Johnson (5/25-6/15/94)... Posted a 7-3 road record(4.17 ERA)…loss Aug. 3 at Baltimore was ﬁrst road loss since July 4, 2013 at Texas... Opened the season on the disabled list witha strained tendon in his right middle ﬁnger…made one rehab start with Triple-A Tacoma... Passed 2,000 innings for his career (including Japan) in his start July 29 at Cleveland…has 2,065.0 combined career innings... Participated in the MLBJapan All-Star Series in his native country ofJapan, making one start... Since making his ﬁrst MLB start July 2, 2012 has gone 37-19 with a 2.97 ERA(163 ER, 493.2 IP) in 77 starts…among pitchers with at least 50 starts during this stretch, ERA is ninth-best in the Majors. In 16 starts went 8-4 with a 2.65ERA (28 ER, 95.0 IP) to rank firstin club history in starter ERA by arookie (2nd, Felix Hernandez, 2.67in 2005)...in 14 relief appearancesposted a 1-1 record with 2 savesand a 4.75 ERA (16 ER, 30.1 IP)...overall ranked 2nd on team with3.16 ERA (min. 100.0 IP) ... Finished the season going 6-2,1.83 ERA (11 ER, 54.0 IP) with 43strikeouts over his last 9 starts...posted the 2nd-best ERA amongst AL starters during the9-start stretch (8/17-end of season, min. 5 GS) ... Went 4-0 with a 1.23 ERA (4 ER, 29.1 IP) with 22 strikeouts in 5 G/4 GS vs. the Angels(4-0, 1.37 in 4 GS)...became just the third pitcher in club history to record 4 wins vs. theAngels in a season: Freddy Garcia (5-0, 0.96 in '01) & Jamie Moyer (4-2, 1.67 in '03) ... Mariners won 8 of the last 10 Iwakuma starts, and went 10-6 in his starts overall ... Amongst AL pitchers with at least 100.0 IP, ranked 7th with a 3.16 ERA (44 ER, 125.1 IP)...ranked 3rd amongst AL starters (min. 15 GS) with a 2.65 ERA (28 ER, 95.0 IP) in 16 starts ... Posted the 5th-lowest ERA by an AL starting pitcher since 1988 at 2.65 (min. 15 GS)...thelast rookies to have a lower starter ERA were Minnesota's Francisco Liriano (1.92) and theAngels Jered Weaver (2.56) in 2006 ... Set Mariners rookie record with 13 strikeouts in first MLB win as a starter July 30 vs.Toronto (8.0,4,1,1,3,13,HR)...old record was 12 by Freddy Garcia (1999), Randy Johnson(1989) and Mark Langston (3x, 1984)...most strikeouts by a MLB rookie since StephenStrasburg (14) in 2010...only Japanese born pitcher with as many strikeouts in a MLBgame is Hideo Nomo (7 G w/13+ strikeouts) ... Made first start July 2 vs. Baltimore (5.0,3,3,3,3,4,HR)...joined Ichiro (RF) and MunenoriKawasaki (2B) as first Japanese trio in a starting lineup...became 2nd Japanese bornpitcher in club history to start on the mound, first since Mac Suzuki in 1999 ... Made 6 relief appearances of at least 3.0 innings (3.05 ERA in those games) ... Notched first MLB win with 2.0 shutout innings June 16 vs. San Francisco ... Recorded first MLB loss June 27 vs. Oakland, allowing only a solo HR in 3.2 IP (1 H, 3SO)...replaced injured starter Kevin Millwood in 3rd inning ... Earned save in consecutive appearances May 30 at Texas (3.0 IP, 5 H, 3 R) and June 2 atChicago-AL (1.0 IP, BB, K) ... Made Mariners debut April 20 vs. Chicago (AL)...was the last MLB player on Opening Dayroster to appear in a game ... Signed a contract extension through 2014with an option for 2015 on Nov. 2. Made 17 starts for Rakuten, going 6-7 with a 2.42 ERA (32 ER, 119.0 IP)...averaged7.0 innings and 99.8 pitches per start...on the disabled list from May 18-July 26 with asore right shoulder...was 3-2 with a 1.72 ERA at the time of his injury...struck out seasonhigh13 batters in CG shutout April 26 at Seibu. Posted second season of 200-plus innings of his career...went 10-9, 2.82 with 4 CG and153 strikeouts in 28 starts...awarded to Oakland via the posting system, but could not reachagreement during 30-day negotiating period. Named Rakuten's Opening Day starter for third consecutive season...part of gold medalwinning Japan squad in the World Baseball Classic...went 1-1 with 1.35 ERA (3 ER, 20.0 IP)in 4 G/3 GS in WBC play. Named the Pacific League MVP going 21-4, 1.87 ERA in 28 starts...also named a NPBAll-Star, Best Nine Award and the Eiji Sawamura Award winner (Cy Young equivalent)...became the first 20-game winner in the Pacific League since Kazumi Saito in 2003...led theleague in ERA and winning percentage...allowed just 3 home runs in 201.2 innings. Named Rakuten's Opening Day starter...sidelined with back soreness and a left obliquestrain...returned to full strength following the All-Star break...finished the season 5-5, 3.40in 16 starts...underwent arthroscopic surgery on his right elbow in October. Limited by lingering shoulder soreness, made only 6 starts...made season debut Aug.29 vs. Nippon Ham...went 1-2 with a 3.73 ERA (16 ER, 38.2 IP). Went 9-15 with 4.99 ERA (101 ER, 182.1 IP) while making 27 starts. Opened the season going 12-0, setting a club record for consecutive wins to opena season...starting pitcher in the NPB All-Star Game...led the league in both wins andwinning percentage (.882)...pitched in Game 5 of the NPB-MLB Post-Season All-StarSeries...earned Best Nine Award...pitched in the 2004 Athens Olympics as a member ofthe Japanese national team (bronze medal). Led the league with 11 complete games...went 15-10, 3.45 with 149 strikeouts in 27 starts...named NPB All-Star. Made 23 starts, going 8-7 with 3.69 ERA (58 ER, 141.1 IP) and 131 strikeouts. Made his NPB debut May 29 vs. Nippon Ham...went 4-2 with a 4.53 ERA (22 ER, 43.2 IP) in 9 appearances (8 GS)...threw CG, 2-hit shutout Sept. 18 vs. Seibu. November 2, 2018 RHP Hisashi Iwakuma elected free agency. September 20, 2018 Tacoma Rainiers activated RHP Hisashi Iwakuma from the 7-day disabled list. 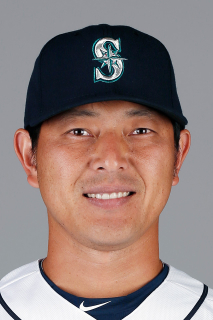 August 25, 2018 Tacoma Rainiers sent RHP Hisashi Iwakuma on a rehab assignment to Everett AquaSox. April 5, 2018 RHP Hisashi Iwakuma assigned to Tacoma Rainiers. November 27, 2017 Seattle Mariners signed free agent RHP Hisashi Iwakuma to a minor league contract and invited him to spring training. November 2, 2017 RHP Hisashi Iwakuma elected free agency. July 24, 2017 Seattle Mariners transferred RHP Hisashi Iwakuma from the 10-day disabled list to the 60-day disabled list. Inflammation in right shoulder. June 19, 2017 Seattle Mariners sent RHP Hisashi Iwakuma on a rehab assignment to Tacoma Rainiers. June 14, 2017 Seattle Mariners sent RHP Hisashi Iwakuma on a rehab assignment to Modesto Nuts. May 10, 2017 Seattle Mariners placed RHP Hisashi Iwakuma on the 10-day disabled list retroactive to May 7, 2017. Inflammation in right shoulder. December 21, 2015 Seattle Mariners activated RHP Hisashi Iwakuma. December 18, 2015 Seattle Mariners signed free agent RHP Hisashi Iwakuma. November 2, 2015 RHP Hisashi Iwakuma elected free agency. July 6, 2015 Seattle Mariners activated RHP Hisashi Iwakuma from the 15-day disabled list. June 25, 2015 Seattle Mariners sent RHP Hisashi Iwakuma on a rehab assignment to Tacoma Rainiers. June 20, 2015 Seattle Mariners sent RHP Hisashi Iwakuma on a rehab assignment to Everett AquaSox. May 3, 2014 Seattle Mariners activated RHP Hisashi Iwakuma from the 15-day disabled list. April 27, 2014 Seattle Mariners sent RHP Hisashi Iwakuma on a rehab assignment to Tacoma Rainiers. April 21, 2014 Seattle Mariners activated RHP Hisashi Iwakuma from the 15-day disabled list. March 27, 2012 Hisashi Iwakuma roster status changed by Seattle Mariners. January 5, 2012 Seattle Mariners signed free agent RHP Hisashi Iwakuma.